Monday was the quarterly check in for the Book Bingo Challenge. Tuesday I reviewed The Raven Boys by Maggie Stiefvater. Wednesday put reading aloud to someone on my bucket list. Thursday I reviewed For Darkness Shows the Stars by Diana Peterfreund. Monday I decided that the movie Stargate was a creeper favorite – one I just couldn’t stop thinking about! Wednesday I put out a call for more unusual shifters in paranormal books. Thursday I reviewed Splintered by A.G. Howard. Friday I asked if you schedule your Discussion posts ahead of time or if you like to just wing it. I got some pretty varied responses too, so make sure to check out the comments section! Monday (2/25) I talked about the BBC miniseries North & South. Tuesday (2/26) I reviewed The Gathering Storm by Robin Bridges. Wednesday (2/27) I asked for more fantasy retellings of real life mysteries. Friday (3/1) I talked about my book cover OCD. Tuesday (3/5) I gushed about The Dark Unwinding by Sharon Cameron. Wednesday (3/6) I put video games on my Bucket List, thanks to Ready Player One. Friday (3/8) I complained about mail I hadn’t received taking up too much brain space to come up with a real discussion post. Monday (2/11) I complained about the poor writing of Star Trek: The Motion Picture. Tuesday (2/12) I reviewed Dark Frost by Jennifer Estep. Wednesday (2/13) I begged authors to write more stand-alones. Thursday (2/14) was Valentines Day! Friday (2/15) I asked if you had any tips on getting business cards. Tuesday (2/19) I reviewed The Crowfield Curse by Pat Walsh. Wednesday (2/20) Kristilyn joined us again to share her Bookish Bucket List: Treehouses! 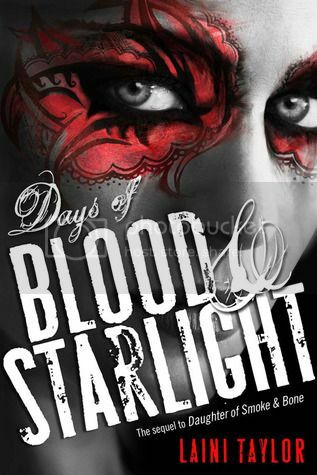 Thursday (2/21) I reviewed Days of Blood and Starlight by Laini Taylor. Monday I talked about the Super Bowl Ads. Kinda disappointing this year, unfortunately. Tuesday I reviewed The Last Dragonslayer – the first in a new YA series by one of my favorite authors! Thursday I reviewed A Discovery of Witches. Friday I responded to a lot of community chatter that’s been going around, both positive and negative. Monday I reviewed the Bond flick Quantum of Solace. Why do I keep picking the gory movies?! Tuesday I complained about the slow start to Unraveling but decided I liked it in the end. A lot of you apparently liked it too! Wednesday I asked for more Elves in fantasy! Where did they all go? Thursday I was surprised that I liked Switched. But I really did! Friday I asked about your dream libraries and described mine.